Regardless, I was hooked on the Avengers, and picked up anything with their name on it I could find. I soon picked up that summer’s two Avengers-branded annuals and they quickly became what I would point to as my ‘favorite” comic. It’s easy to see why: a huge cast, a big history-spanning story, and baseball! By 1987 comics were in the midst of a revolution brought on by the likes of Moore, Miller, Spiegelman, Chaykin, Sim, Los Bros, and others. But I was eight, and books still firmly in the grip of the Bronze Age were more my speed, as these opening pages should quickly tell you. 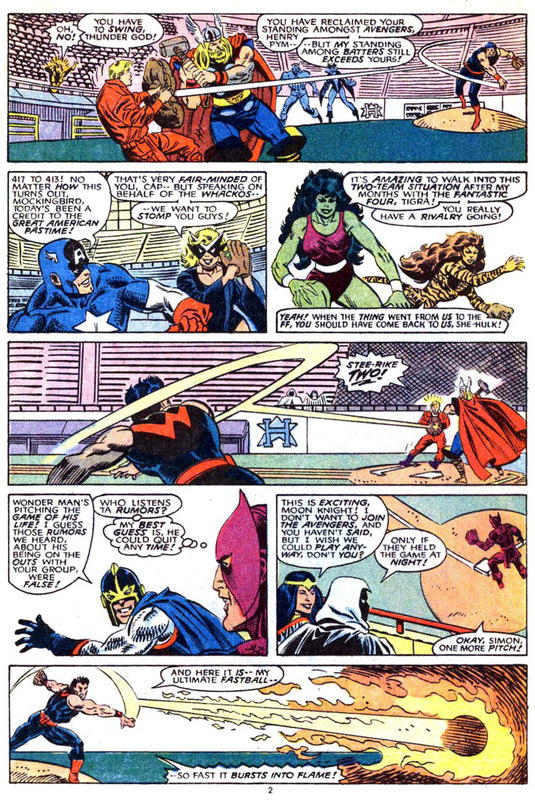 The story — by Steve Englehart, Tom DeFalco, and Mark Gruenwald — was the sort where everyone will get their name and situation explicitly laid out in the opening panels, everyone’s got awkward nicknames like “Shulkie” and “the Whackos”, and footnotes — oh, the footnotes! — will keep you appraised of all the other stories being referenced. 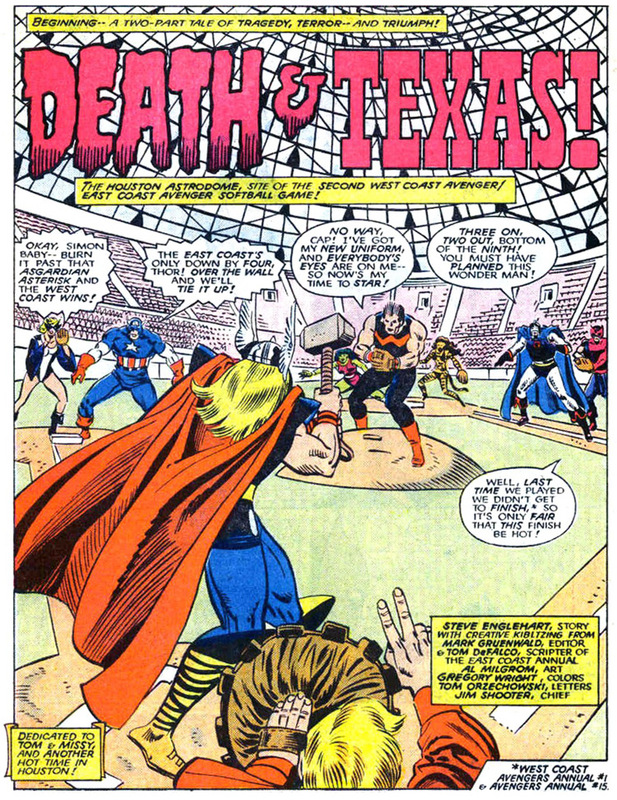 I loved that sort of thing, and even though a footnote let me know this wasn’t the first time the Avengers rented out the Astrodome (and I had no idea the X-Men had been playing intramural sports for years) it was still a charming concept to a young boy. But this was a superhero comic after all, so after three pages of baseball, a special guest star burst through the dome with world-shattering news. 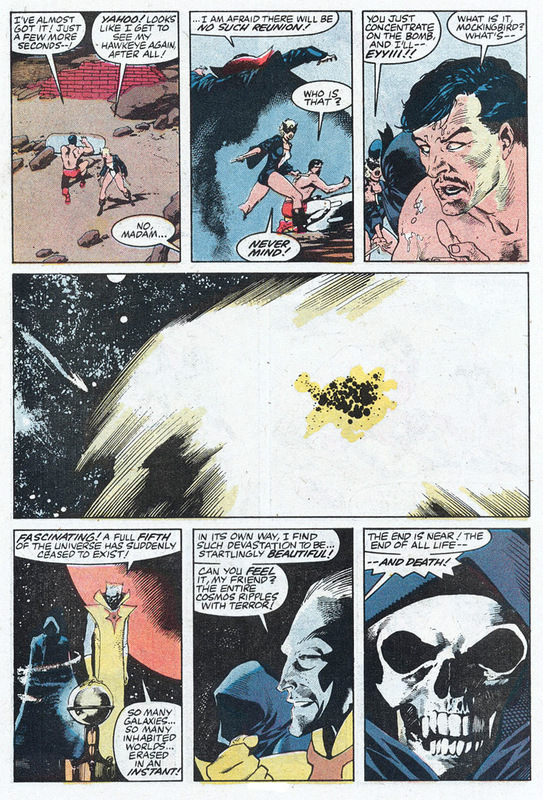 The Silver Surfer — who Englehart had just launched in an ongoing series — warned the West Coast Avengers on the field of a sinister plot hatched by the Elders of the Universe. For some reason, they wanted to kill the Avengers. Somehow, they pulled this off while the Surfer was expositing. 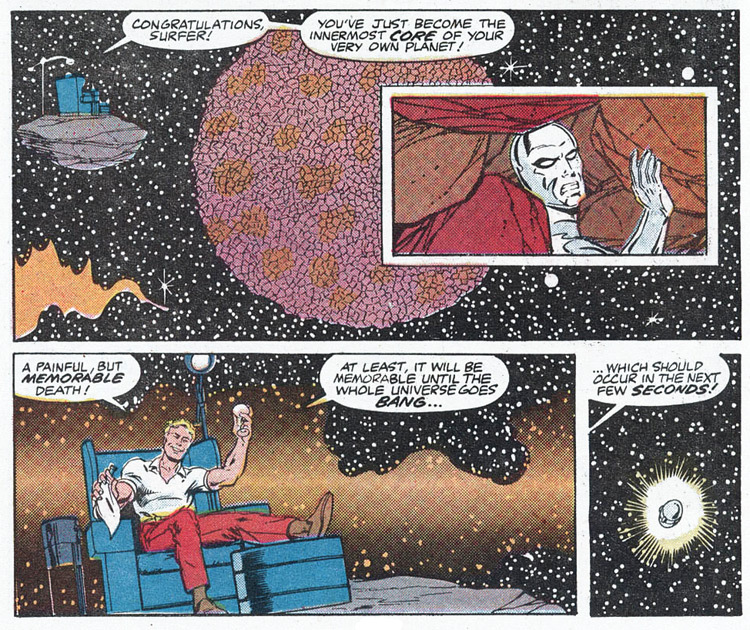 After a gratuitous callback to a Defenders issue Englehart had written fourteen years previous proves to them that the Silver Surfer’s heart is pure, the surviving “Whackos” fly into space to confront the Collector about the Elders’ plot. It all went back to the bizarre Contest of Champions, where the Grandmaster and Death had selected various international superheroes to duke it out in something that was supposed to tie into the Olympics but ultimately did not. 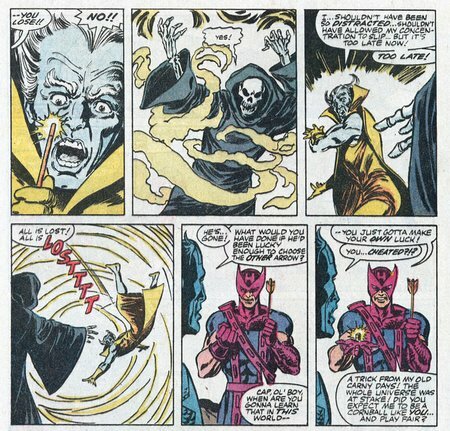 As a result of the Grandmaster winning, the Collector returned to life, but Grandmaster was forced to stay in Death’s realm. 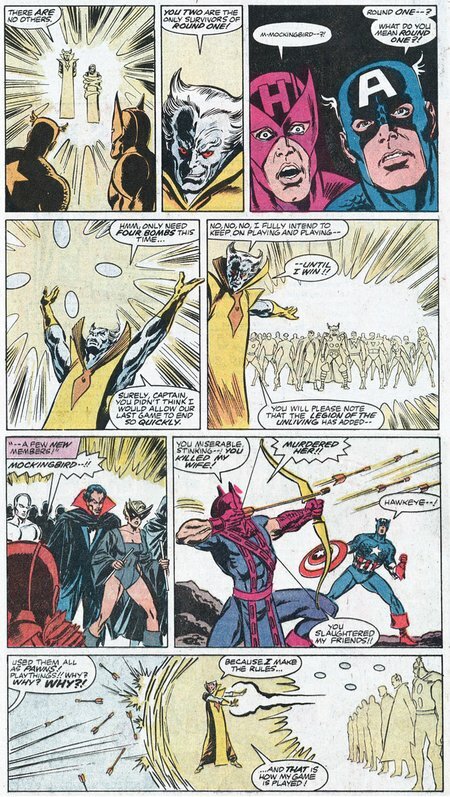 Collector asserts that the Grandmaster somehow killed the Avengers from beyond the grave so that he could use them as pawns once again, but due to some sort of cosmic trademark oversight, the deathwish only applied to the original East Coast Avengers roster, not the West Coast franchise. If the “Whackos” wanted to rescue their fallen teammates, it stood to reason that they’d have to die too. And luckily, Collector had some super-poison lying around. 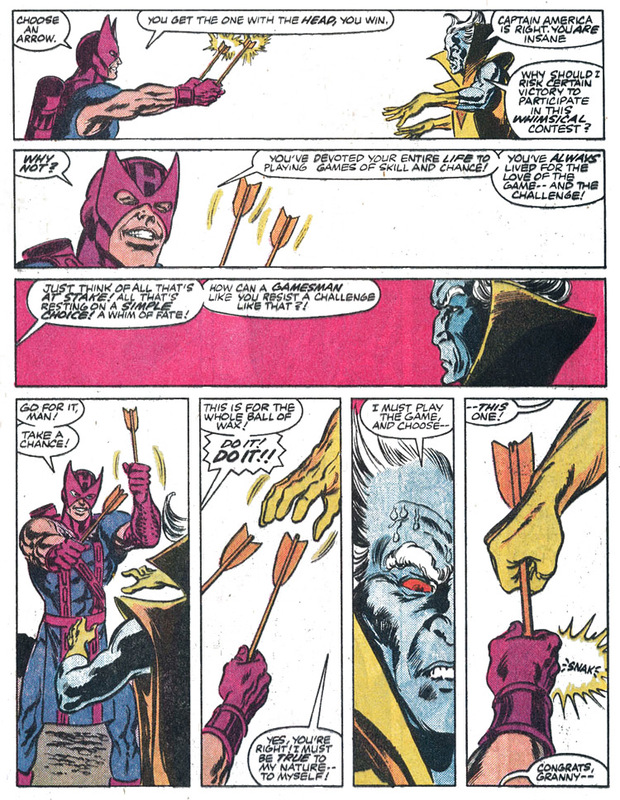 The art in the first issue is handled by Al Milgrom, a rocksteady benchmark of yeoman art for Marvel, but that second panel with the Collector’s bizarre Robin-Meets-a-Skrull face disorted by the jug ‘o’ poison has always stuck with me. 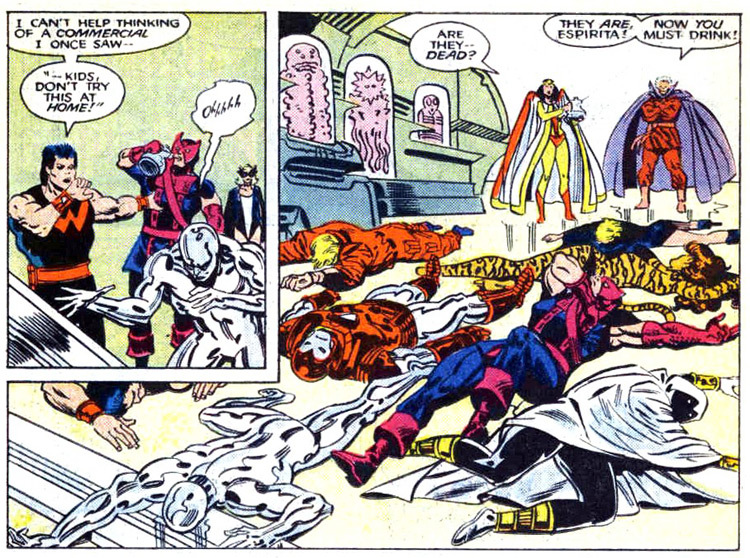 Anyway, after brief deliberation, the West Coast Avengers agree to commit suicide. All except Espirita, because she might have been an angel or something, I forget. I’m not sure Englehart ever got around to wrapping that storyline up, though ironically she was introduced to the Avengers when she intervened and stopped Hank Pym from committing suicide a couple years previous. This is only the first twelve pages! 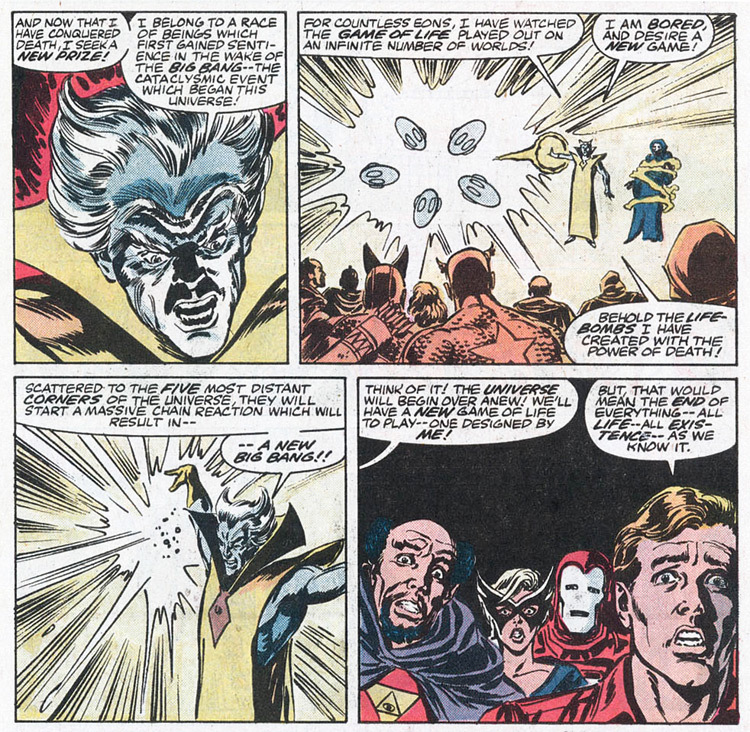 The next thirty-one pages are a series of big fight scenes, as the East Coasters have been convinced by Grandmaster that the West Coasters are dupes of the Collector, with both teams convinced that if they lose, they will all stay dead. It’s pretty much what you’d expect, and fun if you like that sort of thing; I did, and still do. By the end of the match-ups, the West Coast Crew won 4-3, and all parties seem remarkably blithe about the encounter, since all their lives are on the line. Except none of it mattered, because (somehow) the Grandmaster has seized control of Death and her domain! Apparently the whole thing was a long con both Collector and Grandmaster were in on, and they needed to kill both teams of Avengers and have them fight to disrupt Death’s concentration so that Grandmaster could take over. I don’t know how that works either, but it’s as much explanation as you get. It was a few years before I ever actually read a Punisher comic book, so for much of elementary school I assumed that he was a wisecracking, pop-culture riffing guy. Kind of like Max Headroom with guns, from what I can recall. I also associated him with Grandmaster, since they both spent the summer of ’87 fighting against boredom. I had mostly forgotten this line — and my early misconception of the Punisher — until Matt Fraction announced his berth into Marvel writing by using it on his blog. All right, enough James Burke. So Grandmaster wants to blow up the whole universe because it would be interesting. 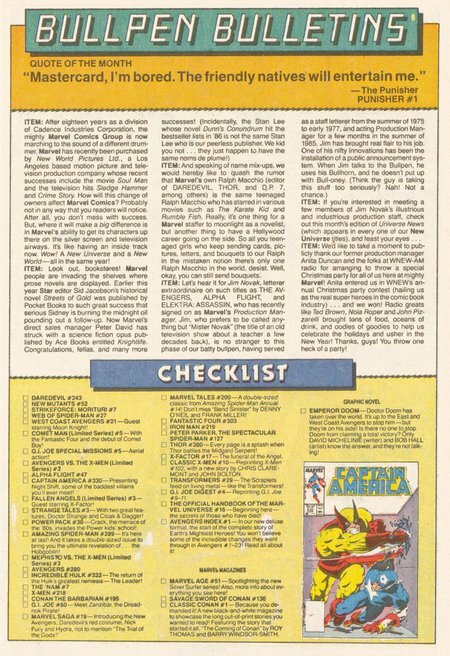 But he’s still an immortal obsessed with games, so he devises a series of levels straight out of a video game, or every JLA/JSA team-up ever: split everyone up into groups and have them try to accomplish a goal! 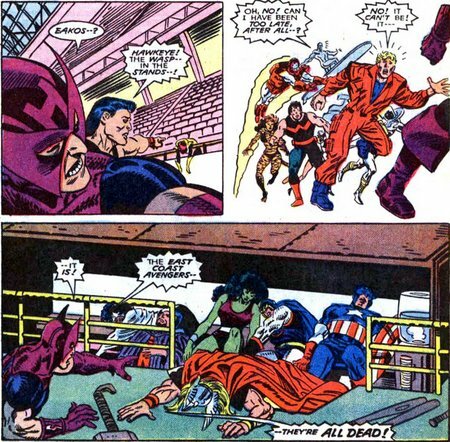 Since the first issue already had the teams darkly foreshadow the early 1990s East Coast/West Coat beef, this bout was to be contested between the Assembled Avengers and the Legion of the Unliving! Also for anyone interested: at present time two of the Avengers fighting the Legion of the Unliving are dead, but another seven and been resurrected since this book came out. 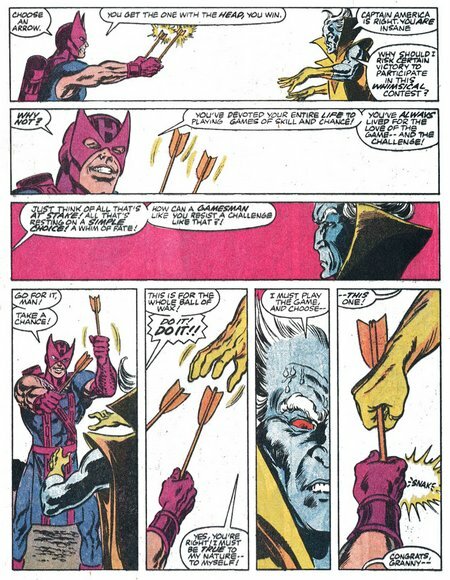 A stiff slap to the face from his idol Cap brings Hawkeye to his senses, and Grandmaster’s shady rulebending reminds him of his own superpower: The Carny Power of Grifting! Knowing that Grandmaster has dedicated his eternal life to the pursuit of games, he offers to bet the universe on a simple game of chance. And like any good carnival game, it’s rigged. 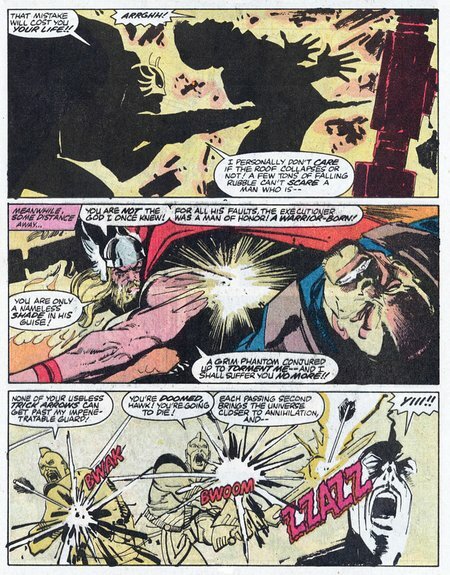 And that’s how Hawkeye used his disreputable upbringing to save the universe and became my favorite superhero. John Constantine, eat your heart out. From there, the whole gang is resurrected and find themselves back at the Astrodome. 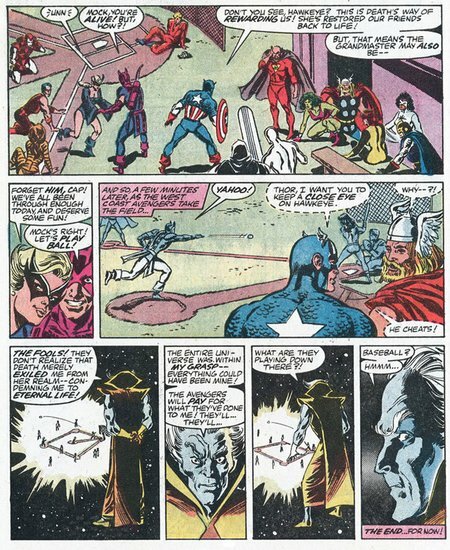 Undaunted by the near-annihilation of life and their own deaths — most of them having been killed twice in the same day — the Avengers shrug their shoulders and resume the baseball game. Sadly, to date Grandmaster’s Sinister Baseball Stratagem has not been revealed. There were undoubtedly better crafted, more significant comics published twenty-five years ago this summer, but none that captured my nine year old heart quite like this one. I live in hope that young Matt Fraction read this alongside Punisher #1, and will inject some of this lovable dirtbag energy into his and David Aja’s upcoming Hawkeye series.